Verreaux’s eagles have an enormous range, but can be seen at only a few scattered sites within it. That’s because the rock hyrax, their preferred prey, lives in isolated communities among rocky niches. The eagles hunt in pairs to seek out this guinea-pig-size animal and stage surprise attacks. What is the preferred prey of Verreaux’s eagles? Verreaux’s eagles prefer hyraxes and live mostly near the rocky habitats these small mammals favor. Verreaux’s eagles will eat other animals if hyraxes are rare. Verreaux’s eagles usually live in pairs, though some are solitary. Either way, they are fiercely territorial. Birds in courting displays give a high-pitched scream sprinkled with barking sounds. Verreaux’s eagles hunt by suddenly sweeping around a mountainside or a cliff to catch hyraxes off guard. Because they can pull in their wings slightly, these eagles can fly in high winds that ground other birds. ​Overall, the population of Verreaux’s eagles appears to be stable. It is listed as lower risk by the International Union for Conservation of Nature (IUCN). Verreaux’s eagles favor hyraxes, but when they are scarce, the birds will eat hares, guineafowl, tortoises, and klipspringer (“rock jumper”) lambs that can weigh more than 26 pounds (12 kg). 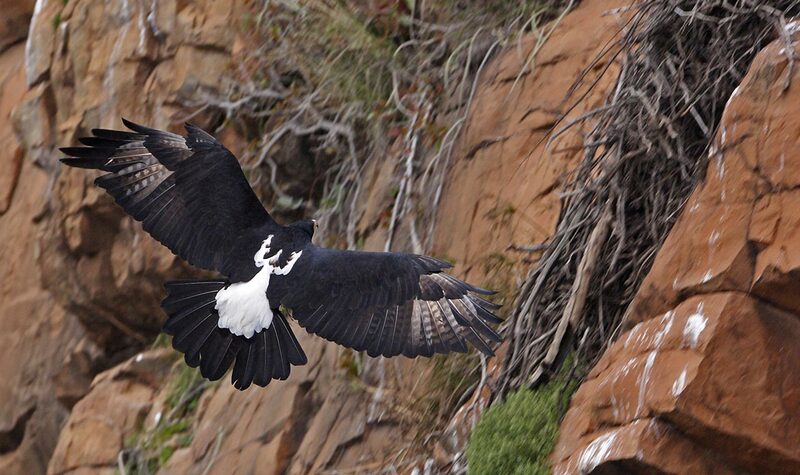 The Verreaux’s eagle nests on rocky ledges and builds a huge nest of sticks lined with leaves. The female lays one to 2 eggs, which are incubated for 43 to 46 days by both adults. The Verreaux’s eagle practices what ornithologists call “obligate siblicide.” If two chicks hatch, the younger almost invariably dies of starvation or bullying by its sibling. The surviving chick stays in the nest for almost 100 days. After it fledges, it will follow its parents for about six months. 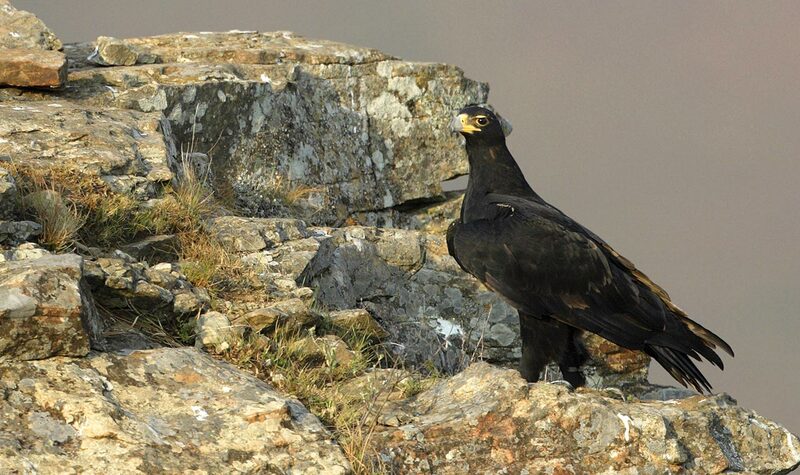 ​In Kenya, the range of the Verreaux’s eagle extends over the western part of the country. Verreaux’s eagles live in the same habitat as hyraxes: mountains, bush and wooded grassland, and semiarid terrain from sea level to 11,480 feet (3,500 m). Their range extends from the coastal mountains of Angola around the tip of Africa to Zimbabwe; through the Rift Valley from Eritrea to Tanzania, then west to the Democratic Republic of the Congo; and along the Chad-Sudan border, with several small areas on the Arabian Peninsula. 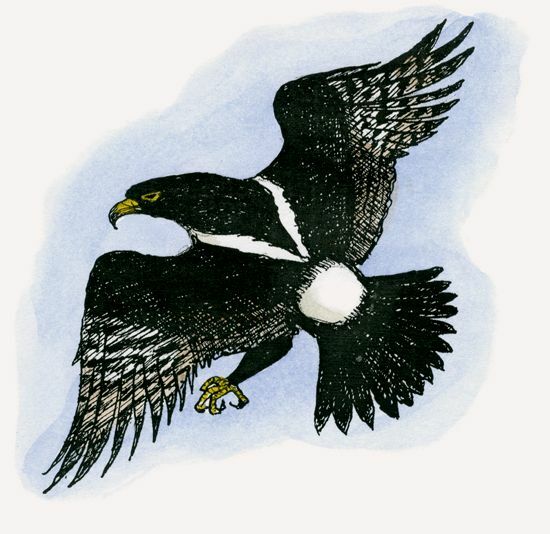 Verreaux’s eagles have been seen maneuvering in winds as high as 97 miles per hour (157 kph). That’s hurricane force!